Super savers who have helped raise over £800,000 for Yorkshire Air Ambulance have been recognised at a special awards evening. Barnsley Building Society has been supporting the rapid response emergency charity since 2008 when it launched its Saving Saves Lives savings account. With one per cent of average daily balances paid to Yorkshire Air Ambulance (YAA), more than £800,000 has so far been donated. The Society received a special Corporate Partner Award award at the annual YAA Recognition Awards held at Aspire, Leeds. The income stream has proved vital in both maintaining the charity’s two helicopters and in building reserves to enable the YAA to place an order for a state-of-the-art replacement aircraft that will take to the skies over Yorkshire next year. The latest generation Airbus H145 helicopter will replace the older of the charity’s two aircraft, G-SASH, and offers exceptional flight performance with significantly lower operating and maintenance costs. It has a larger cabin and provides paramedics with a much more modern medical fit-out to treat and transport often critically injured patients. 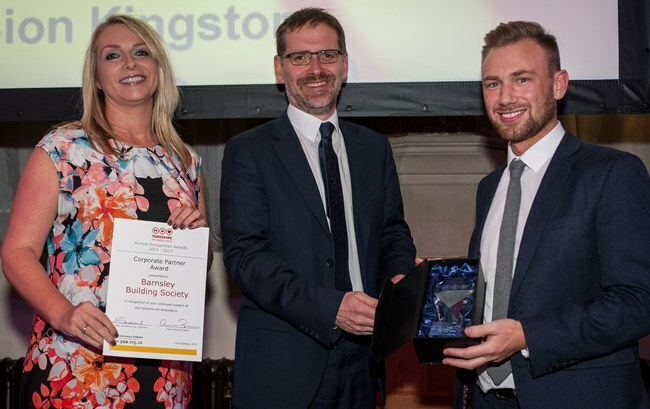 Other fundraisers, volunteers and corporate supporters of the YAA from across Yorkshire were recognised at the annual Recognition Awards event, hosted by charity patron and ITV weatherman Jon Mitchell. Yorkshire Air Ambulance serves 5million people across Yorkshire and has carried more than 6,300 people in its 15-year history. The independent charity needs to raise £12,000 each day to keep its two helicopters in the air and flying, which is equivalent to £4.4 million a year.